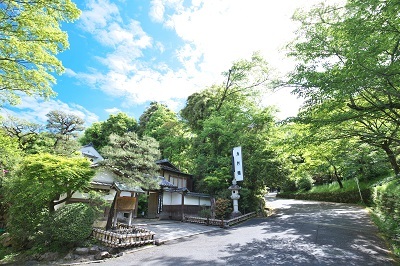 On May 5th, we helped a client couple to hold a wedding ceremony at Saami (ryoutei restaurant) which was surrounded by the bright fresh greens. 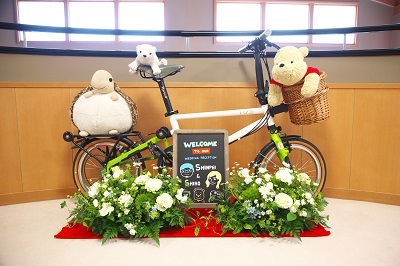 The couple, Mr. and Mrs. M, runs a bicycle shop in KAGAWA prefecture. Every time I met them, I was impressed with their personality. 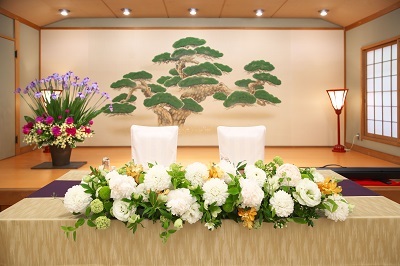 Gorgeous Iris on the stage, arranged by KISHI-sensei, were perfect match for the ceremony. 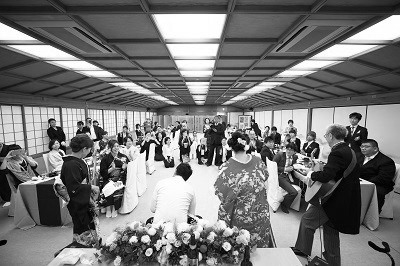 The bride’s family members formed a band “G　Fours ” and they played very well in a perfect harmony even without enough time for rehearsal. 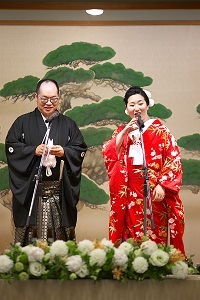 The bride and groom themselves performed “Manzai(=comic dialogue)” on the stage to entertain their guests. It was really an unique wedding ceremony. Their wedding was filled with laughter and tears. I can imagine that they are now smiling and laughing a lot at their bicycle shop. Congratulation on your wedding M-sama and S-sama!